This is Book One in the Summer Series and has been widely acclaimed as one of the first books to deal in a totally open and honest way with a family that struggles with mental illness. When her mother becomes too ill to look after her, eleven-year-old Anneke sets out on her own with her border collie, Sheera. While hiding in the mountains, with wild animals, without food, during a horrendous thunderstorm, with the hillsides crawling with searchers, Anneke must make some bold decisions. Will she go back to the foster family she has stayed with before? Will her mother ever get better? 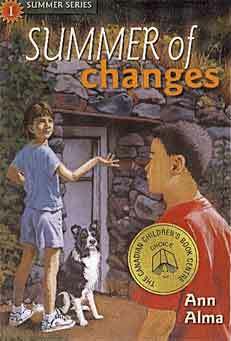 Summer of Changes was a Silver Birch Regional winner, was nominated for the Red Cedar Award, The Diamond Willow Award, the Chocolate Lily Award and was an OUR CHOICE book. Rated "Excellent, enduring, everyone should read it. ...full of pathos, optimism and love..."
Endorsed by The Society for people with Schizophrenia. And yes, the dog in the book was real; she was Ann's own border collie, Shira. See the separate page about Shira/Sheera. Also have a look at what reviewers said about the Summer Series books.